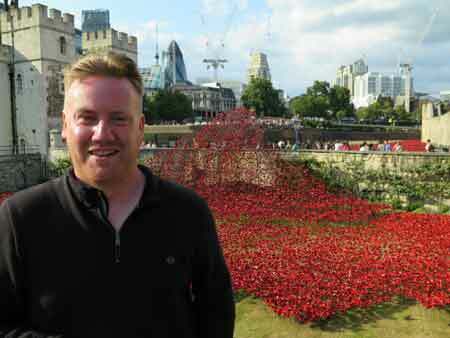 The final poppy has been planted at the Tower of London, completing ‘Blood Swept Lands and Seas of Red’, the ceramic art installation created by University of Derby graduate, Paul Cummins. Paul handed the final poppy to Army cadet Harry Hayes (13), who planted it in the moat at the Tower just before 11am (November 11, 2014). The artwork, which now consists of 888,246 ceramic poppies, one for each British and Colonial fatality during the war, was chosen as the country’s lead project to mark the 100th anniversary year of the outbreak of the First World War. The installation has been visited by royalty, including the Queen and the Duke and Duchess of Cambridge, and photographed from on board the Mir space station. Paul graduated in 2010 with a BA (Hons) Craft degree and is now undertaking a PhD at the University of Derby. Professor John Coyne, Vice-Chancellor at the University of Derby, added: “We are immensely proud of Paul’s success. It’s incredible to think this world-wide phenomenon began at Paul’s studio right here in Pride Park, Derby. Volunteers will begin to remove the ceramic poppies tomorrow. 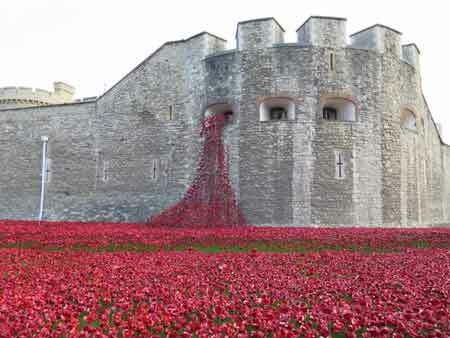 The exhibition has been so popular with visitors that the remaining parts of the instalment – The Weeping Window, which is made up of thousands of poppies cascading out of the Tower’s window and The Wave, which rises over the causeway used by visitors to enter the castle – will then travel the country, to Britain’s towns and cities, before being permanently installed at the Imperial War Museum in London and Manchester from 2018.